Double LP version. "Resurrected from the ashes of one of the most influential death metal bands of all time -- Nocturnus -- Nocturnus AD was initiated by founder/mastermind/death metal legend Mike Browning (also co-founder of Morbid Angel) to continue the path that was laid down, twenty-eight years later, by the legendary Florida death metal band's seminal 1990 album The Key, an album recognized as one of the most important death metal albums of all time. Entitled Paradox, this debut album is the direct and proper follow-up to that album, musically and thematically, with the story and themes vocalist/drummer Browning laid out then continuing on through the lens of the occult. The story follows the journey of Dr. Allen William Magus (aka Dr. Magus), a scientist who got ravaged by a war plague disease and kept what was left of himself alive by creating a bio suit. Musically, the album's otherworldly, technical dark atmospheric occult death metal blueprint harnesses and carries on the energy of the original album as well as the overall cult death metal vibe of the early '90s in the singular forward-thinking that Nocturnus exhibited back then. With Browning commanding the craft alongside a lineup that also forms his other band, After Death, the Nocturnus legacy continues through guitarists Demian Heftel and Belial Koblack, bassist Daniel Tucker (ex-Obituary), and keyboardist Josh Holdren. With the blazing and fervent guitar work and the carefully orchestrated keyboards being the most developed out of any Nocturnus-related release, these integral components solidify the calculated pummeling rhythm section and resurrect their classic sound. And of course Browning's distinct vocals spewing the incantations contain the classic vocal traits from the original album as well as Morbid Angel's classic Abominations Of Desolation, which Browning was the co-writer of. Paradox will see Nocturnus AD reclaim and continue to properly carry the torch of the legacy Nocturnus' laid down with The Key, finally, after twenty-eight years." "Resurrected from the ashes of one of the most influential death metal bands of all time -- Nocturnus -- Nocturnus AD was initiated by founder/mastermind/death metal legend Mike Browning (also co-founder of Morbid Angel) to continue the path that was laid down, twenty-eight years later, by the legendary Florida death metal band's seminal 1990 album The Key, an album recognized as one of the most important death metal albums of all time. Entitled Paradox, this debut album is the direct and proper follow-up to that album, musically and thematically, with the story and themes vocalist/drummer Browning laid out then continuing on through the lens of the occult. The story follows the journey of Dr. Allen William Magus (aka Dr. Magus), a scientist who got ravaged by a war plague disease and kept what was left of himself alive by creating a bio suit. Musically, the album's otherworldly, technical dark atmospheric occult death metal blueprint harnesses and carries on the energy of the original album as well as the overall cult death metal vibe of the early '90s in the singular forward-thinking that Nocturnus exhibited back then. With Browning commanding the craft alongside a lineup that also forms his other band, After Death, the Nocturnus legacy continues through guitarists Demian Heftel and Belial Koblack, bassist Daniel Tucker (ex-Obituary), and keyboardist Josh Holdren. With the blazing and fervent guitar work and the carefully orchestrated keyboards being the most developed out of any Nocturnus-related release, these integral components solidify the calculated pummeling rhythm section and resurrect their classic sound. And of course Browning's distinct vocals spewing the incantations contain the classic vocal traits from the original album as well as Morbid Angel's classic Abominations Of Desolation, which Browning was the co-writer of. 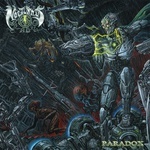 Paradox will see Nocturnus AD reclaim and continue to properly carry the torch of the legacy Nocturnus' laid down with The Key, finally, after twenty-eight years."